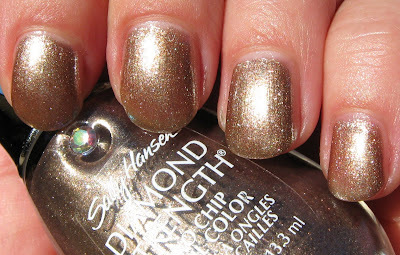 I spotted a new Sally Hansen Diamond Strength display last week when I picked up the XTreme Wear LE colors, and this is the only one that interested me. I also picked up a few similar toned shades from Sally's Fall Insta-Dri Collection, which I'll have up next. Shining Moment is a darker golden bronze shade that looks more taupe in the bottle. It's filled with tiny multi colored glitter that appealed to me in the bottle a bit more than it does on the nail. If only it could look as good as the macro shot above! Shining Moment is pretty, but I used three coats and could possibly use one more, so that's not a good thing. 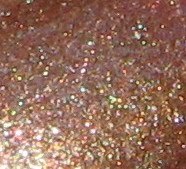 I'm undecided as to just how much I like this one--the shade and the glitter are gorgeous in theory, but the end result is the true test and it didn't finish as strong as I would have hoped. This looks lovely - perfect for Autumn. I had the exact same experience! Bought it expecting a super pretty sparkly taupe and it was mostly a meh gold. Pretty but not what I was hoping for. What a pity the end result isn't as good as expected 'cause the color is pretty. Hi there! Can you please compare this polish to China Glaze's Swing Baby (Vintage Vixen) Thanks! This is a pretty shade in the macro shot. Shame it doesn't show as well on the nails. I'll wait till these show up at the Dollar Store. WOW i really like this, first one of these diamond strengths i've liked in a long time!